Alabama is my adopted home state. I bounced around the United States as an Air Force brat, and later as a member of the service myself. In 2001, I handed in my uniform and moved to Alabama (because that’s where my wife wanted to live and I wanted to stay married). In April of 2011, a series of devastating tornados ripped through the state, killing hundreds of people and destroying homes and communities. I was fortunate enough to not be directly affected, but Bo Jackson’s heart broke for the home of his youth. He decided to raise money to help out, and thus was born the Bo Bikes Bama ride for the Governor’s Emergency Relief Fund. In the first two years, more than $700,000 has been raised to help rebuild more than 400 homes and 27 community storm shelters. Riders from more 24 states have logged more than 38,000 miles riding in the event. The reason for this ride is for state unity and to pay homage to the great Alabamians who lost their lives on April 27th, 2011. I am my brothers’ and sisters’ keeper. 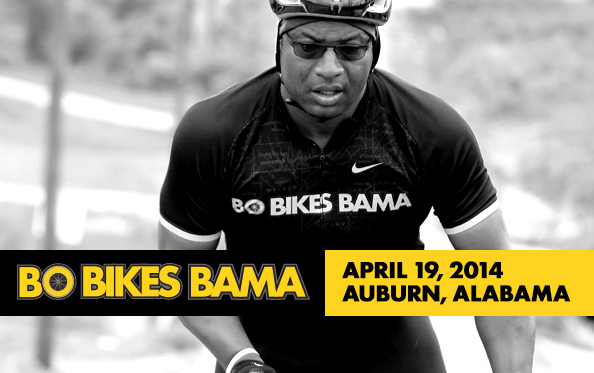 James at the start of the 2013 Bo Bikes Bama ride. Last year I rode and it was an amazing event. Even though I bonked out due to poor nutrition, I was in awe of the spirit of the people who came to ride. This was and is about Alabama the State, not the rivalry between our biggest schools, the University of Alabama and Auburn University. It’s about us coming together to help everyone int he state…even if you root for Florida or LSU. I knew I would ride again in 2014, but I didn’t know that raising money would be a component of the ride this time. Every dollar counts, and what better way to build some excitement than to make it a competition! Call it the Iron Bike instead of the Iron Bowl! This is how it works: Every dollar donated is a vote for either Alabama or Auburn. On April 19th, 2014, I will ride with the colors of the school that raises the most money through my page. Simply make a donation and leave a comment so I know how to count the funds. Will the fans of Bo Jackson’s alma mater Auburn donate in droves, forcing me to where Orange and Blue (though I root for the Crimson Tide)? Or will the Tide fans donate in large enough numbers that I’m wearing Crimson and White in the home of the Tigers, as the ride begins and ends in Auburn, AL? When I made the announcement on Saturday, Bama scored first with $20. But Auburn fans on Twitter stormed back, scoring $55 and taking a solid lead. Donations are administered by the United Ways of Alabama. Donations count toward the competition through April 18th, 2014. 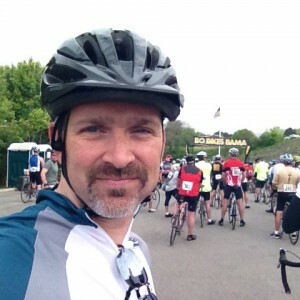 What will I wear for the 62-mile ride? Donate, spread the word, and tell me! Oh, and thanks for supporting this great cause. Alabama is a beautiful state with wonderful people. If you haven’t been here, don’t judge it by media reports from New York or the stories of Hollywood tell you. This is home, and it’s a great place to be. Choose ALABAMA or AUBURN and donate today!